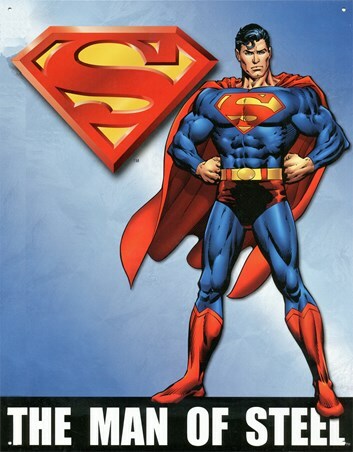 Children's Tin Sign: Known as the Man of Steel, Clark Kent's alter ego Superman is pictured here in his suit of red and blue as his cape floats purposefully behind him. Standing against a background of sky blue, the iconic Superman logo stands out in red and yellow and across the bottom in black and white it reads 'The Man of Steel'. Perfect for children and grown ups a like, this brilliant Detective Comics character tin sign is a must have for comic book fans. High quality, framed The Man of Steel, Superman tin sign with a bespoke frame by our custom framing service.